I love a good hot dog, so I was dying to try Dan’s Dogs in Medina. The only problem is that the only time I’m in Medina I am usually visiting family and eating with them. I had my chance recently when my niece had a play she had written performed at her school by an acting troupe, and I needed a place to have lunch afterwards. Dan’s Dogs immediately came to mind. The place is adorable. 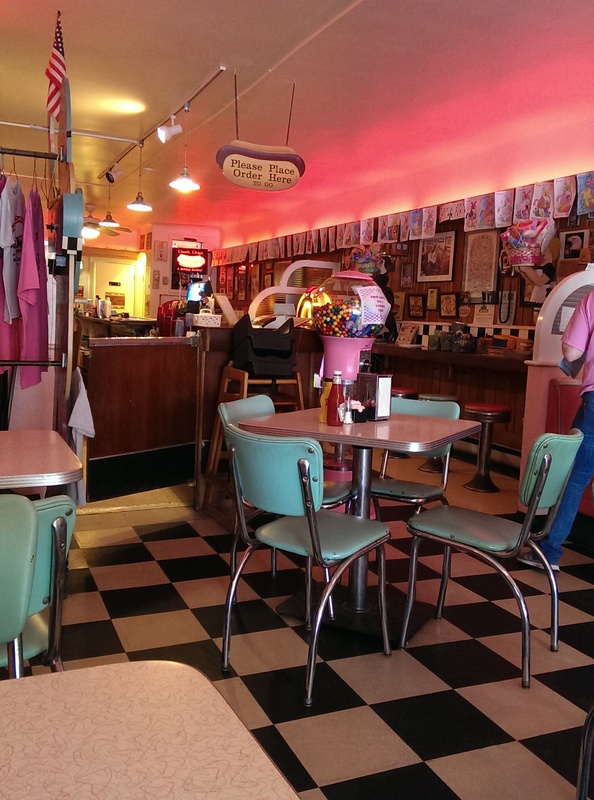 Very 1950s retro with a diner flair. It opened in 1991 and is located just northwest of the Square. It’s not The Happy Dog, nor does it try to be. 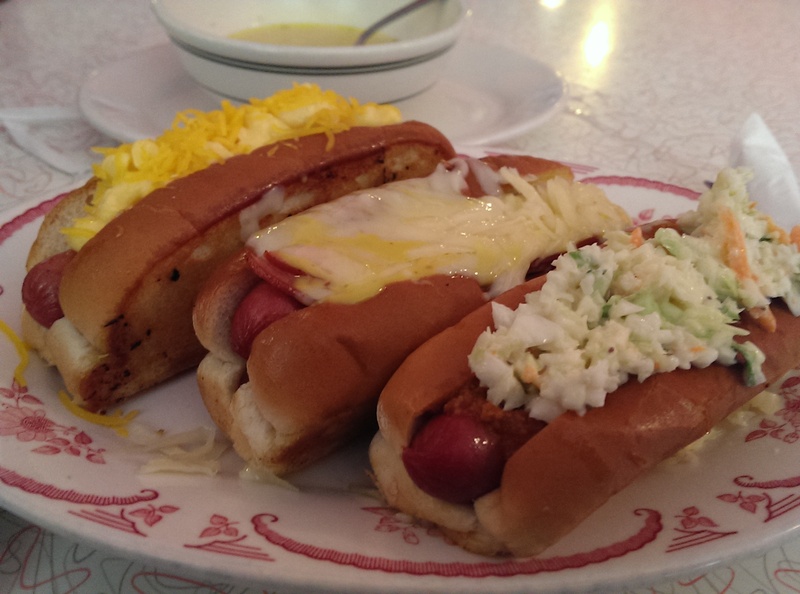 It is just a good, old-fashioned hot dog diner. Dan’s Dogs uses all beef hot dogs, grilled to order and served on a signature buttered and toasted split-top New England style bun. This bun was really amazing. The menu is extensive with 41(!) hot dogs to choose from and over 50 toppings if you want to build your own. If you don’t want a hot dog (but come on, why wouldn’t you order one? ), they also offer grilled cheese sandwiches, grilled burgers, chicken sandwiches, salads, and more. I had trouble narrowing down what I wanted to order. I started off with a root beer, because they make their own old-fashioned root beer and I’m a sucker for a good root beer. It was really good and quenched my thirst. If you like root beer floats, this would be the place for one. They also apparently make their own ice cream. 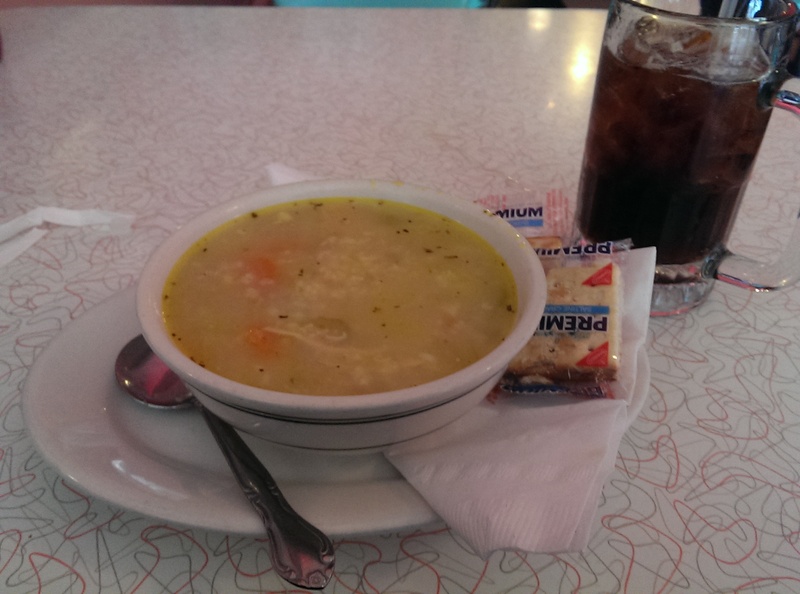 I was in the mood for a nice soup, and the soup that day was a chicken and rice soup. The broth was well-seasoned and the soup had chunks of carrot, celery and strings of chicken, so I could tell it was homemade. It was very good, although the rice had broken down a bit since it was later in the day after the lunch rush. My only complaint was that the server didn’t clear the soup bowl when she brought my dogs, but that is truly a minor complaint. Now the big dilemma – what hot dogs to order. I ordered while I was still hungry, so I ordered three different “regular size” hot dogs. You can also order jumbo dogs if you are so inclined. Three dogs and soup was definitely too much, and I ended up taking half of each one home for later. My choices were The Mac Attack (smothered in their homemade five-cheese mac & cheese), the Top Dog (topped with grilled bacon and melted cheddar cheese), and a Firehouse Dog (“Red Hot” chili coney dog topped with homemade cole slaw). All three were really good, but that cole slaw was delicious – super creamy just the way I like it. It was a great pairing with the coney sauce. You can choose all kinds of weird and wonderful hot dogs, like the Hula Dog with baked beans and crushed pineapple; the Junkyard Dog with freshly chopped veggies, melted mozzarella cheese, sour cream sauce and fresh diced tomato; or the Deputy Dog with peanut butter and jelly, or your classics like the Old Yeller with mustard, relish and diced onions; the Chicago Dog with its mustard, relish, onions, cucumber, hot pepper pickle and celery salt; or Hound Dog with caramelized onions and grilled mushrooms. There is literally something for everyone – or you can make your own. They are closed on Sundays, but now accept credit and debit cards (they used to be cash-only). 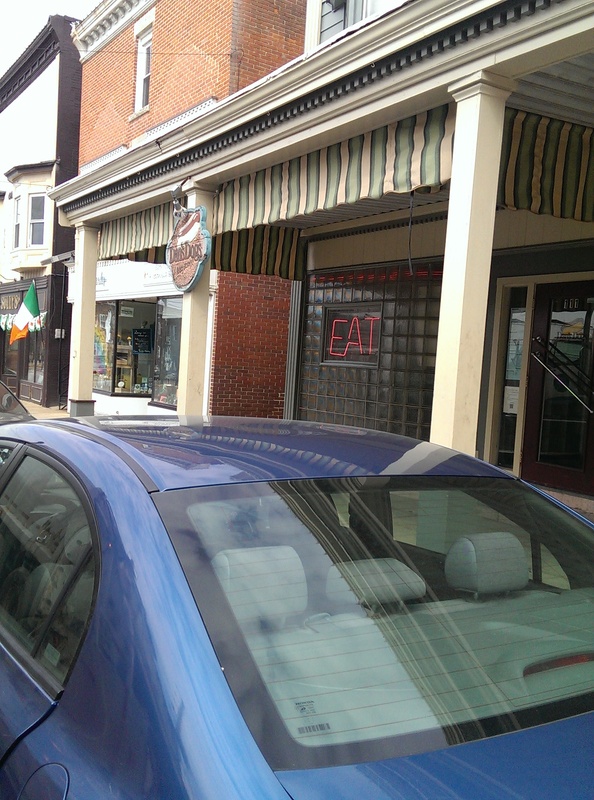 So the next time you are in Medina and want to try a good dog, check this place out. It’s family-friendly and locally owned and operated. Never heard of it. How fun!